We are so happy that Baubie is getting her strength back! 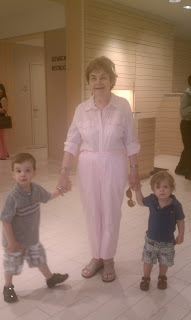 We had fun visiting her in Atlanta and celebrating her birthday with a fabulous lunch at Nieman Marcus. After lunch, Matt had so much fun sitting on the frilly couch in the Lilly Pulitzer store while Noah pointed out his favorite floral designs on purses and bags. 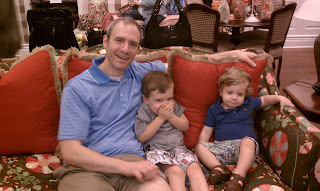 What could make a dad happier? It was a great weekend, made even better by Baubie's improved health!